This sweet and savory chicken tagine recipe is easy to prepare in either a heavy-bottomed pot or traditional tagine. Add the optional white pepper and Ras el Hanout if you'd like extra spicy seasoning to contrast with the syrupy sauce. As with other Moroccan fruit tagines, toasted sesame seeds or fried almonds can be added as a garnish. Serve the dish with Moroccan bread for scooping everything up. Double the cooking time if using a clay or ceramic tagine. You should also consider alternative versions of the recipe, such as Lamb or Beef Tagine with Dates. 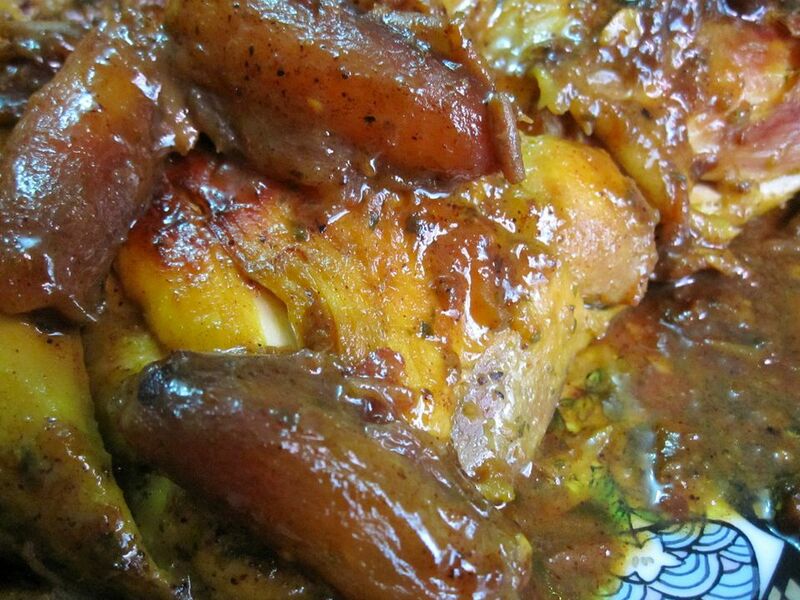 In a large heavy-bottomed pot, mix the chicken with the onions, garlic, spices, oil, and butter. Cover and cook over medium-low to medium heat for about 15 minutes, until rich sauce forms in the bottom of the pot. Stir frequently to turn and brown the chicken on all sides. Add the broth and the cilantro. Place the dates, cinnamon, and honey in a small pot with the reserved liquids. Stir gently to combine, then simmer over medium heat for 5 to 10 minutes until the dates are tender and the sauce is syrupy. To serve, transfer the chicken and its sauce to a serving dish. (Discard the cinnamon stick and cilantro.) Spoon the dates and syrup over the chicken, garnishing if desired with sesame seeds or fried almonds. Slice one of the onions instead of grating it, and layer the onion rings on the bottom of the tagine. Mix the chicken with the grated onion, garlic, oil, butter, and spices, and place the chicken, meat side down, on the onion rings. Swirl the broth in the bowl to cleanse it of the seasoning, and pour the liquid into the tagine. Place the cilantro bouquet on top of the chicken. Cover and place the tagine on a diffuser over medium heat-low. Allow the tagine to reach a simmer (this may take a long time), and then reduce the heat to the lowest temperature necessary to maintain the simmer. When the chicken has finished cooking, place the dates, honey, and cinnamon into a small pot with the reserved liquids. Stir to combine, then simmer for 5 to 10 minutes, until the dates are tender and the sauce is syrupy. To serve, remove and discard the cinnamon stick and cilantro. Spoon the dates and syrup over the chicken (garnish with sesame or almonds if desired) and serve the dish directly from the tagine.